STOpFrac is funded by a £866K Project Development Award from the National Institue for Health Research Invention for Innovation programme, grant no. II-LB_0216-20009. This project continues on from the HICF-funded project An Automated Tool to Identify Vertebral Fractures in Various Imaging Modalities. STOpFrac is a collaboration between the University of Manchester, Central Manchester NHS Foundation Trust, and Optasia Medical, with input from the National Osteoporosis Society. 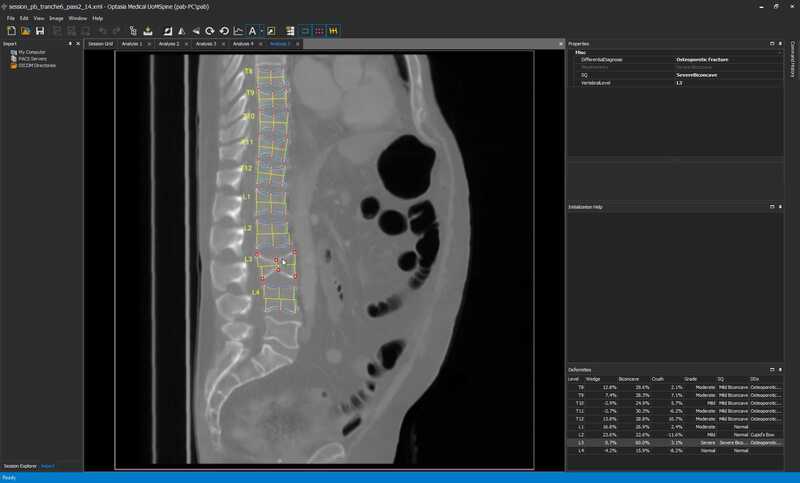 The aim is to develop a system that can automatically analyse a variety of clinical images, segment the vertebrae, and identify any abnormalities so that they can be brought to clinical attention. Unmet Need: Osteoporosis is a condition in which there is too little bone in the skeleton. Those affected have “brittle” bones, and are much more likely to suffer from fractures, most commonly in the spine, wrist and hip. These lead to pain, deformity, loss of independence and early death. Half of all women and 1 in 5 men aged over 50 will suffer a fracture due to osteoporosis. The treatment of fractures could cost the UK over £2 billion by 2020. Vertebral (spine) fractures are the most common fractures in osteoporosis and anyone who has one is much more likely to have other fractures in future, so may need treatment. However, more than half of vertebral fractures do not cause any pain so may not be noticed. Though they are visible on medical images taken to investigate other conditions, they are often not reported and the chance to treat the fracture and underlying osteoporosis is missed. Technology: We will develop a fully automated computer system for identifying vertebral fractures in medical images in which the spine is visible. It will be able to work with existing NHS systems to make it as easy as possible to be set up in a hospital. The software will build upon our existing state-of-the-art prototype. We will study how well the system works and how many patients it will help, and will gather patients’ views on how it should be used and whether it is good value for money for the NHS. Impact: The system will identify people with vertebral fractures who would otherwise have been missed. Treating these people should ultimately reduce the number of future fractures, including potentially fatal hip fractures. This could reduce the suffering of many people, and reduce the cost of management to the NHS. The machine learning algorithms developed through this project are used in the AVERT software that our industrial collaborators Optasia Medical Ltd use in their ASPIRE™ service. The software is currently in use at the University of Manchester and the University of Sheffield. Potential users of the AVERT software or the ASPIRE™ service should contact Optasia Medical to discuss their requirements. © 2017 Dr Paul A Bromiley. | Design by FCT.